Growthis not nice to have, it's and imperative. 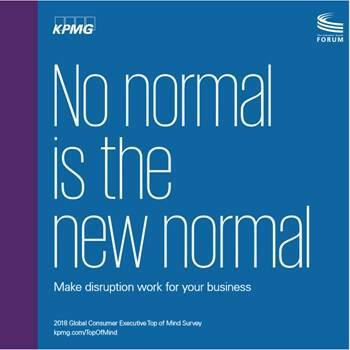 Willy Kruh explains why companies need to move quickly if they are to thrive in a time of unprecedented disruption. Change is one of life’s certainties, so those who look only to the past and the present are likely to be caught out by the future. This is particularly true in the consumer and retail sector, which is being transformed by three revolutions at once: geographic, demographic and technological. This turbulence is reflected in our sixth annual Global Consumer Executive Top of Mind Survey, in which 31 percent of respondents say new disruptive competitors are redefining the industry. Executives also said that changing technology (25 percent) and competition from platform businesses (24 percent) are significant challenges. While navigating through a volatile marketplace, companies recognize that digital transformation, artificial intelligence, innovation and customer centricity are all, ultimately, a means to an end – and that end is growth. Growth is not a nice to have – for increasingly exacting investors, it is an imperative. Businesses that fail to recognize this may become footnotes in the history of the industry. Growth is as much about mindset as market conditions. CEOs need to ask if their culture, strategies and business models facilitate growth or inhibit it. It’s common sense for most companies today to realize that in order to deliver consistent, sustainable growth, they need to spend less time listening internally and more time listening to the customer. Judging from this year’s Top of Mind Survey, this is becoming increasingly evident. The question is: are companies responding fast enough?